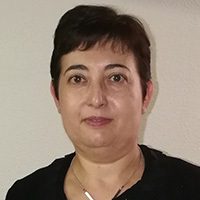 Inmaculada Campoy is EVA/EBA Senior Technical Specialist of the Repsol Polyolefins Technical Assistance and Development Department. She joined the Repsol Technology Centre in 1998 and was the senior researcher responsible for projects related to synthetic rubber. She obtained a PhD in Chemistry from the Universidad Complutense de Madrid and has worked as a researcher in the Polymer Science and Technology Institute (CSIC) and the University of Southamptom on projects related to liquid crystal polymers. Immaculada is the author of twenty-two scientific publications. Pressure-sensitive hotmelt adhesives (HMPSA) are mainly based on synthetic rubbers (styrene-butadiene copolymers or styrene-isoprene copolymers) and they are widely used in the manufacture of items such as tapes, labels, and hygienic and medicals products. In this work, we present some pressure-sensitive hotmelt adhesives prepared with EVA copolymers as an alternative to the rubber formulations made with styrene-butadiene copolymers (SBS) or styrene-isoprene copolymers (SIS). In general terms, the EVA copolymers show better UV radiation, oxidative and thermal resistance than the rubber copolymers as they do not include double bonds in their structure. We present some HMPSA formulations that include different EVA copolymers, rosin tackifier and different types of plasticisers. EVA copolymers with high comonomer content can improve the tack properties of these formulations due to a reduction of the crystallinity and glass transition temperature. Dynamic rheology analysis has been used to characterise these adhesives.